Investigators correlated influx of a CSF tracer into the brain of mice with EEG power, heart rate, blood pressure, and respiratory rate in wild-type mice under six different anesthesia regimens. They found that glymphatic CSF tracer influx was highest under ketamine/xylazine followed by isoflurane supplemented with dexmedetomidine and pentobarbital. The ease with which cerebrospinal fluid (CSF) flows through the brain's glymphatic system under anesthesia is strongly affected by the choice of anesthetic, according to a study published February 27 in the journal Science Advances. Anesthesia has been used as a proxy for sleep to study glymphatic flow, the lead author Maiken Nedergaard, MD, DMSc, professor of neurology and neuroscience and co-director of the Center for Translational Neuroscience at the University of Rochester Medical Center in Rochester, NY, told Neurology Today. Dr. Nedergaard first described the glymphatic system in a paper in Science Translational Medicine in 2012. The glymphatic (from “glial lymphatic”) system describes a pathway for clearance of interstitial fluid and the waste products it contains that is more directed than simple diffusion. In 2013, Dr. Nedergaard and colleagues showed that glymphatic flow was much greater during sleep than wakefulness. They proposed that one of the major functions of sleep was to promote glymphatic clearance of waste products such as amyloid-beta. In the current study, the investigators observed that the best influx occurred with the anesthetic ketamine/xylazine (K/X) and was worse with inhaled anesthetics. CSF penetration was directly proportional to the strength of delta waves, which characterize deep sleep, and was inversely proportional to heart rate. Laboratories have studied glymphatic flow using different anesthetics, which may account for differences in how faithfully they mimic sleep, and perhaps how they affect glymphatic function, Dr. Nedergaard said. Clinically, anesthetics also differ in their propensity to induce post-operative cognitive impairment or delirium, a significant problem especially in the elderly and those with pre-existing cognitive decline. It has been proposed, but not yet confirmed, that this impairment is due to an anesthesia-induced decrease in glymphatic clearance of metabolic waste during the peri-operative period, she said. To address the relationship between choice of anesthetic agent and glymphatic function, Dr. Nedergaard, along with first author Lauren Hablitz, PhD, and colleagues, assessed glymphatic movement of CSF in mice under the influence of six different anesthetics, including K/X, pentobarbital, and inhaled isoflurane. CSF penetration was measured using a fluorescent tracer injected into the cisterna magna. They also assessed heart rate and respiration rate, and using EEG, determined the intensity of various types of sleep-related brain waves in the anesthetized state. Dr. Nedergaard found that tracer movement into the brain parenchyma was most effective with K/X, intermediate with pentobarbital, and poorest with isoflurane. The amount of tracer movement was tightly correlated with the strength of delta wave oscillations, with the strongest delta wave activity in mice receiving K/X, and the weakest in those receiving isoflurane. “Delta activity is a measure of deep non-REM sleep,” Dr. Nedergaard said, and the conclusion from the data here was that the most robust glymphatic function occurs not simply during sleep, but during deep non-REM sleep. It is not yet clear whether the connection is mechanistic or just correlational—that is, whether delta-wave activity somehow promotes glymphatic function, or is just a marker for it. “We are studying that now,” she said. The inverse relationship between heart rate and glymphatic flow makes sense, she said, because the slower heart rate produces more efficient movement of the arterial wall that functions as a pump for CSF inflow and reduces backflow, allowing more rapid movement of the interstitial fluid. “Why different anesthetics have such differing effects on glymphatic flow remains unknown,” Dr. Nedergaard said, “but given that, careful choice of anesthetic to study the glymphatic system is important for cross-lab comparisons.” It seems likely, she added, that some of the early controversies in establishing the validity of the glymphatic hypothesis may have stemmed from such differences in experimental technique. “The results of this study should be of interest to biologists interested in the glymphatic system, anesthesiologists and neurointensivists treating the elderly especially, and neurologists and geriatricians interested in sleep changes in aging and neurodegeneration,” said Jeffrey Iliff, PhD, associate professor and vice chair for basic science research in the department of anesthesiology and perioperative medicine at the Oregon Health & Sciences University in Portland. Dr. Iliff was not involved in the current study but was a co-author of the 2012 paper in on the glymphatic system with Dr. Nedergaard, whose lab he worked in at the time. The glymphatic system is a brain-wide network of spaces surrounding blood vessels that supports a rapid exchange between the brain interstitial compartment and the cerebrospinal fluid,” Dr. Iliff explained to Neurology Today. That process is not only more rapid, but also more organized and more regulated than was hypothesized by the previous model of interstitial fluid clearance, the “CSF sink hypothesis,” which proposed simple diffusion and non-directed bulk flow as the clearance mechanism. Important questions about basic glymphatic function still remain, he added. Importantly, he said, even the unconscious state induced by K/X is not precisely the same as sleep, and so conclusions about glymphatic function in sleep remain to be confirmed. Drs. Nedergaard and Gakuba had no disclosures. Dr. Iliff has served as a consultant for GSK and work in his group related to glymphatic function in humans has been funded in part by a sponsored collaborative agreement with GSK. •. Hablitz LM, Vinitsky HS, Sun Q, et al Increased glymphatic influx is correlated with high EEG delta power and low heart rate in mice under anesthesia http://advances.sciencemag.org/content/5/2/eaav5447. Sci Adv 2019;5(2): eaav5447. •. Iliff JJ, Wang M, Liao Y, et al A paravascular pathway facilitates CSF flow through the brain parenchyma and the clearance of interstitial solutes, including amyloid β http://stm.sciencemag.org/content/4/147/147ra111. Sci Transl Med 2012;4(147):147. •. Xie L, Kang H, Xu Q, et al Sleep drives metabolite clearance from the adult brain http://science.sciencemag.org/content/342/6156/373. Science 2013;342(6156):373–7. 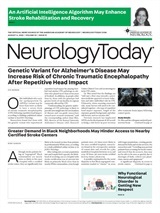 Neurology Today19(7):8-10, April 4, 2019.